Sok Song’s passion for folding paper has bloomed from a hobby he taught himself from books during his childhood to an award winning origami design business called Creased, Inc. Sok is the author of Origami Chic: A guide to Foldable Fashion published by Capstone and Crease + Fold: Innovative Origami Projects Anyone Can Make published by Random House. He also published and produced 12 issues of a periodical called Creased: Magazine for Paper Folders. 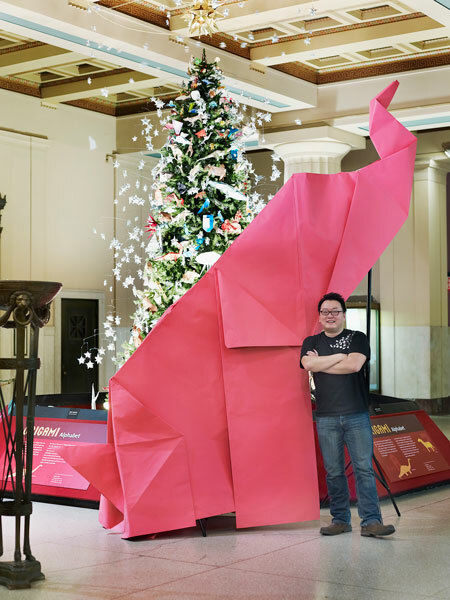 In addition to the magazines and books, he has evolved the business into a creative services company incorporating origami and paper sculpture as a medium for advertising, graphic design, and installation. His custom design work and sculptures have been seen in magazines such as: Vogue, Vanity Fair, Elle, InStyle, Cosmopolitan, Pop, Marie Claire, Icon, Self, GQ, and L'Uomo and as well as in books published by Andrews McMeel Publishing, Firefly Books Ltd. (UK), and Quark Publishing. Other notable clients for design and installation work include: Condé Nast Publications Ltd., Merrill Lynch, Paul Smith, Kenzo, Saks Fifth Avenue, Rockwell Group, Walmart, Kanebo International, The Museum of Art and Design, The Amercian Museum of Natural History, MOMA, Imitation of Christ, Parsons Brinkerhoff, Macys, Harrods, The Company Store, Niebaum Coppola Winery, Mondo Mannequins, Takeda Pharmaceuticals, Saatchi & Saatchi, J. Walter Thompson, Gotham, Inc, The Children’s Place, Fast Company, Gant, Cottonelle, Vogue, Money Magazine, Time, Inc. and The New Yorker. Sok currently lives in New York City, although his folding work takes him all over the world.